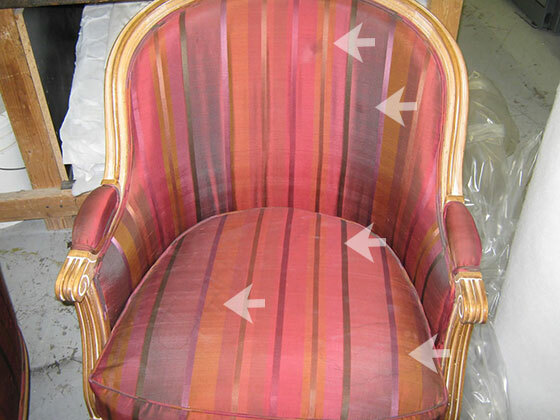 This image shows the water stains on the upholstery. 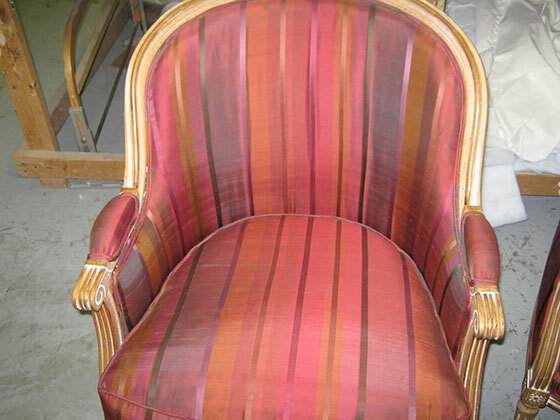 As you can see, our clients can count on us for water stain removal as part of our upholstery cleaning services. A storage company was holding a number of pieces while the client’s apartment was being renovated. Although the piece was covered with plastic, there was a leak in the air conditioning unit of the facility and water dripped through a vent on the ceiling onto one of a pair of antique chairs. Somehow the water penetrated the protection and left several water marks on the seat and some marks on the back as well. You can see these water marks if you look closely where the arrows are pointing in the first image. We first tested the material in an inconspicuous area to determine if the cleaning process would cause further damage. When our methods proved to be safe, we proceeded. Applying a mist of distilled water can sometimes be the step that will result in a success rather than a failure with this type of fabric blend. We waited for the distilled water to settle and then implemented a low-moisture cleaning with our normal cleaning detergent. Using a hairdryer on the cool setting (wanting to avoid heating up the material and drying it too quickly as to cause it to pucker), we expedited the drying process. We repeated this process several times until the spots were completely removed. As you can see in the second image, the water spots were completely removed. The results were a success, and because of our services, the storage company was able to avoid an insurance claim. To learn more, visit our Upholstery Cleaning Services page. For a free estimate on upholstery cleaning services throughout NY, NJ, and CT contact us online or call your local number 212-777-4040 | 718-776-3564 | 516-377-0993 today.